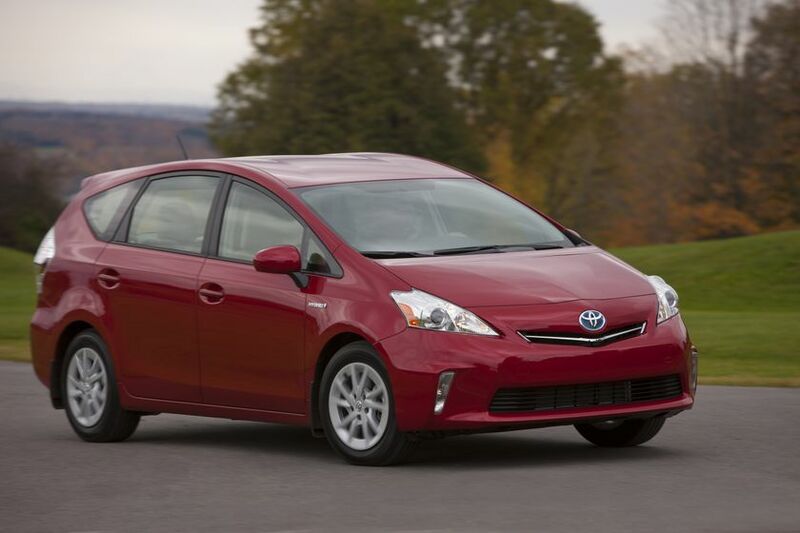 The newest entrant in a growing Prius family of hybrid vehicles, the Prius v delivers an unparalleled blend of versatility and fuel efficiency in a comfortable, mid-size package. The Prius v is a new evolution in hybrid vehicles with excellent cargo space and Prius’ heritage of environmental performance and fuel economy. The Prius v uses the same proven Hybrid Synergy Drive system as the third-generation Prius, with the advantages of high mileage, low emissions, and never needing to be recharged. 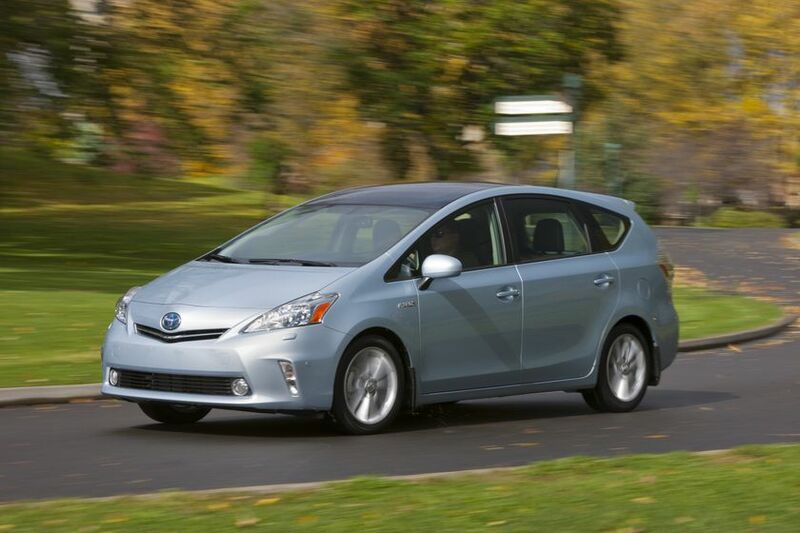 The Prius v emphasizes overall proportion with spaciousness and flexibility for active families. Comfortable interior space and good visibility have been assisted by a high seating position, ample head room, and an impressive 38-inch couple distance, providing generous rear legroom. A low, wide-opening rear hatch reveals 34.3 cubic feet of cargo space behind the rear seats, making it the most spacious dedicated hybrid vehicle on the market. A wide variety of engineered storage spaces are located throughout the cabin. These include dual glove boxes, a center console utility tray and five cup holders in large and medium sizes. Bottle holders are built into the front and rear door pockets, while all models will feature an overhead storage space suitable for sunglasses. In addition to the larger main luggage compartment, there are storage units built into the sides and under the cargo platform for storing equipment such as car wash items or gloves. Even a special space for umbrellas is located under the second row of seats. Rear seats fold, slide and recline to configure for any mix of passengers and cargo, and operation switches are located conveniently close to the occupants. New for Toyota, an available seat material called SofTex is designed for easy cleaning, resisting spills and wear in a family vehicle that could see heavy use on a daily basis. Soft to the touch, SofTex’s attributes as compared to leather and other traditional leatherette-type materials include a weight reduction of 50 per cent, a manufacturing process with approximately 99 per cent fewer volatile organic compounds (VOCs) than conventional synthetic leather, and it’s water and stain resistant. It also does not include any animal-based material. Seamlessly integrated into the Prius v are state-of-the-art electronics and enhanced connectivity features, including a Bluetooth wireless connection for compatible hands-free phone calls as standard. Also standard is a USB port that allows playing of music and video from portable audio devices, using the vehicle sound system and in-dash display screen, including full iPod integration. The standard audio system has a 6.1-inch screen and six speakers. The screen also displays the energy monitor and fuel consumption data, and functions as the monitor for the integrated back-up camera and the Display Audio System. The screen also offers a new value-driven navigation system and serves as a portal for the Toyota Multimedia system. The system will also include SiriusXM Satellite Radio™. The top-of-the-line audio is equipped with a new seven-inch Premium HDD Navigation system with Multimedia system and JBL. This system offers a new split-screen feature that allows for simultaneously displaying navigation and audio information and full iPod video integration. The premium system adds a new JBL GreenEdge™ audio system that combines an eight-channel amplifier and door-mounted “acoustic lens” speakers, to provide a high-quality sound. The GreenEdge amplifier achieves a 66-per cent reduction in overall mass and a 50-per cent enhancement in sound efficiency. The GreenEdge speakers produce a higher output of sound with the same power or less consumption of conventional models. With a balance between outstanding spaciousness, refined style, and smooth aerodynamics, Prius v has a low 0.29 coefficient of drag, which does not inhibit the vehicle’s convenient packaging. It is a new vehicle designed from the ground up, with a shape that evolved from Prius rather than being an elongated version. Keeping air resistance low is the familiar triangular Prius silhouette, adapted to a larger size. A flush surface from the front of the vehicle through the front pillar works with side “aerocorners” for exceptionally clean airflow. The smooth front sheetmetal blends into a carefully designed roof and cabin, leading to an optimized cabin-end shape that acts to converge side and roof airflow. Wheels and wheel caps are designed with aerodynamic effects in mind. These measures and others also have the beneficial effect of suppressing wind noise. 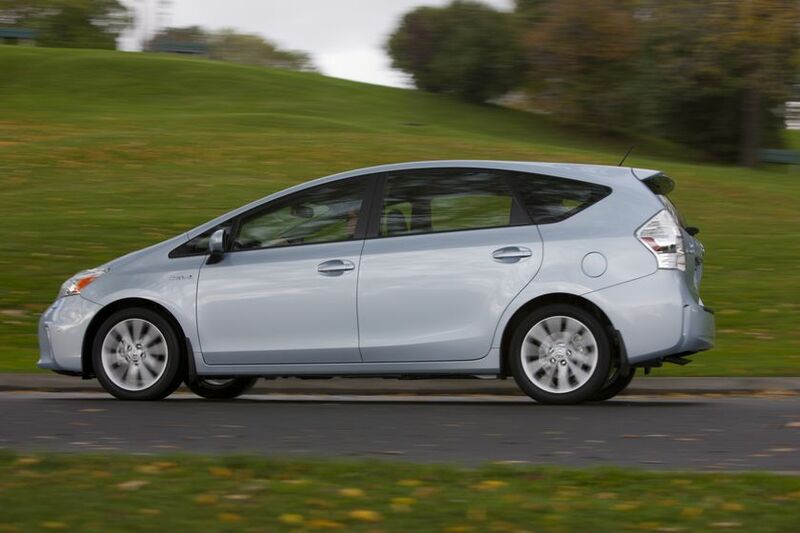 Enhancing the clean, low wind-resistance design are materials that keep the Prius v relatively light and easy to move. The door panels are foam-injected with polypropylene and the deck board with light-weight urethane to produce a weight savings of approximately 20 per cent. Significant weight reduction is also achieved through the use of high-tensile grades of steel throughout the body along with aluminum in key body panels and systems. High-strength steel sheets and bars used throughout the body to ensure a light, yet highly rigid platform structure. Also available, and a Toyota-first, is a resin Panoramic View Moonroof with power retractable sun shades that provides an open atmosphere in the cabin with a 40 per cent reduction in weight as compared to conventional glass roofs of the same size, and excellent heat insulation performance. This improved thermal resistance means the engine needs to run less to preserve comfortable ambient temperatures, which in turn enhances fuel efficiency. The moonroof has an electrically operated shade system with a jam protection function. Available LED headlamps work to improve visibility while reducing current draw. They use projector lenses to offer long-range visibility and are designed to be virtually maintenance free for the expected life of the vehicle. Prius v features a climate control system with enhanced cooling capability to cope with a larger cabin. The system uses an electric compressor, so the air conditioning can run without depending on the engine, and improved component design for better maximum-demand cooling performance. 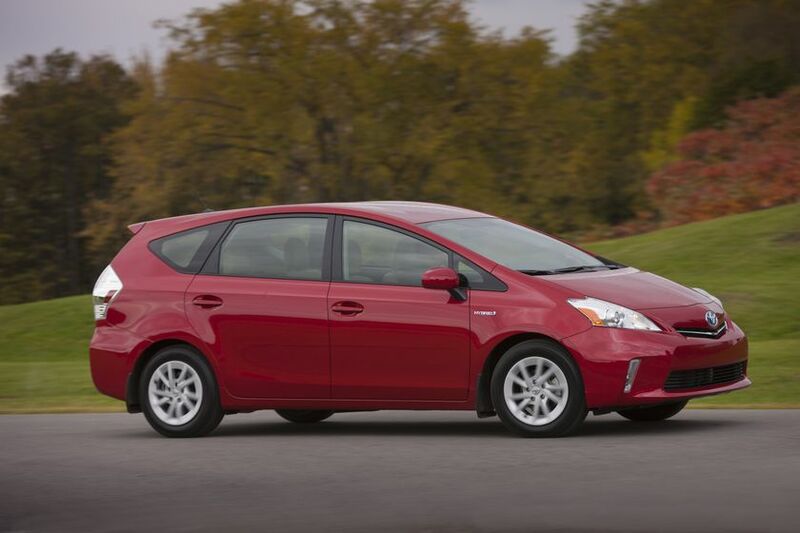 The Hybrid Synergy Drive system in the Prius v is essentially the same as the current third-generation Prius. The system uses two high-output motors, one 60kw (80 hp) unit that mainly works to power the compact, lightweight transaxle and another smaller motor that mainly works as the electric power source. Maximum motor drive voltage is 650 volts DC. The proven and practical nickel-metal hydride battery pack is the same as on the third-generation Prius liftback, but with a cooling duct located under the rear seat. As with current-generation Prius cars, Hybrid Synergy Drive is a series-parallel hybrid system that can provide power either from the engine alone, or the motor alone, or any mix of both. A hybrid control computer manages the system so that optimum power is delivered according to driver demand. It uses a start/stop system and regenerative braking to conserve fuel and recharge the battery upon deceleration. Hybrid Synergy Drive is built around a specially adapted, efficient 98-horsepower1.8-liter four-cylinder engine that runs on the Atkinson cycle and contributes to a total system horsepower of 134. Key components include an electric water pump that requires no belts, and an exhaust gas recirculation (EGR) system that helps warm the engine quickly, reducing fuel consumption when the engine is cold. Compact and light weight, the engine produces minimal noise and vibration. Sophisticated valve control, injector design, and other technologies reduce emissions to allow the Prius v to qualify for SULEV and Tier2 Bin3 emissions standards. In addition to the standard driving mode, Prius v drive system also includes an Eco driving mode, an EV driving mode, and a Power mode. In Power mode, enhanced mid-range response enables easier coping with slopes and mountainous terrain. In EV mode, the Prius vcan run on battery power alone for short distances and lower speeds, up to about a mile. In Eco driving mode, the engine management system prioritizes fuel economy, managing throttle response and limiting power consumption from the air conditioning. A new feature, Pitch and Bounce Control, works with suspension enhancements to improve ride comfort and control. Because the Prius v is a larger vehicle more likely to carry loads and passengers, front and rear suspension components have been redesigned to improve handling and ride quality. Front coil-over spring and damper capacities have been significantly increased and a new upper support has been designed. The steering gear has been attached to the front suspension member, and the stabilizer bar repositioned for more responsive steering feel and enhanced ride comfort. In the rear, a torsion-beam suspension design has been fitted with appropriately tuned springs and dampers. The new rear-suspension system is designed to help ensure stability and ride comfort, and it has a lower mounting point to improve luggage space. Pitch and Bounce Control uses the torque of the hybrid motor to enhance ride comfort and control. The system, working with wheel-speed sensors and in tune with the suspension, helps suppress bounce and toss motions to improve comfort for occupants. Because it helps control the balance and posture of the vehicle as a whole, it also functions to improve handling response. Standard wheels are 16 inches in diameter, with 17-inch wheels available as an option. A variety of available and standard features maintain the Prius tradition of premium-level equipment packaging. Not least among them is a broad suite of advanced features, both active and passive, that are designed to help maximize occupant safety. The all-new Prius v platform is designed with a force-absorbing body structure. Increased use of high-strength steel, notably in the front frame members, is a key part of providing a strong body structure without increasing weight. Helping to protect the cabin from side and rear intrusions are similarly engineered reinforcements using high tensile steels, all designed to disperse energy strategically throughout the vehicle to help protect passengers. Like all Toyota models, the Prius v will feature Toyota’s Star Safety System™ standard, which includes Vehicle Stability Control (VSC), Traction Control (TRAC), Anti-lock Braking System (ABS), Electronic Brake-force Distribution (EBD) and Brake Assist. It also features the standard Smart Stop Technology brake-override system. An electronic tire pressure monitoring system is standard equipment, and there are seven airbags strategically located about the cabin, including a knee airbag for the driver. New driver and front-passenger seat design helps lessen the possibility of whiplash injury during certain types of collisions while minimizing weight. A new Vehicle Proximity Notification System helps alert pedestrians and cyclists of an oncoming vehicle under certain conditions by emitting a small warning sound. An available Pre-Collision System (PCS) retracts seatbelts and applies the brakes in certain conditions when a frontal crash is unavoidable. It is paired with Dynamic Radar Cruise Control. 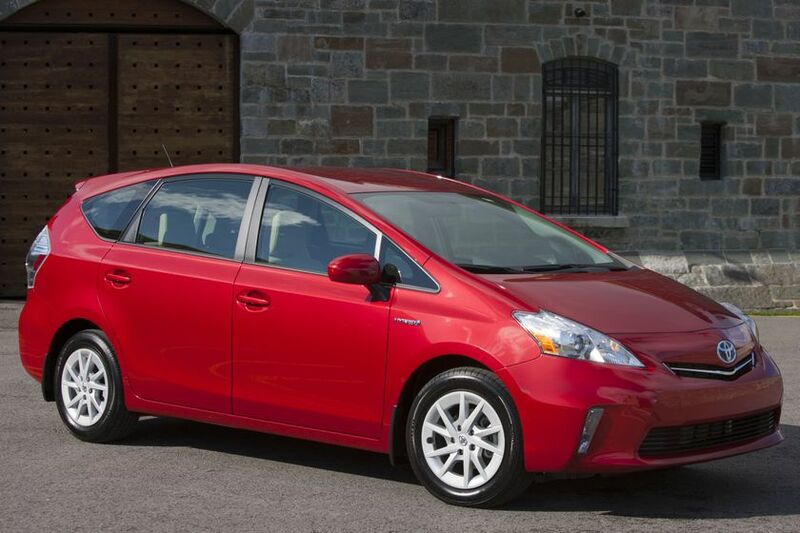 The all-new 2012 Prius v is now on sale across Canada with a manufacturer’s suggested retail price starting at $27,200. Toyota Canada Inc. (TCI) is the exclusive Canadian distributor of Toyota, Lexus and Scion cars, SUVs and trucks, and Toyota Industrial Equipment. Toyota is the first full-line manufacturer to make all of the elements of the Star Safety System standard on every new 2011 vehicle. The Star Safety System includes Vehicle Stability Control (VSC), Traction Control (TRAC), Anti-lock Brake System (ABS), Electronic Brake-force Distribution (EBD), Brake Assist (BA) and Smart Stop Technology (SST). TCI’s head office is in Toronto, with regional offices in Vancouver, Calgary, Montreal and Halifax and parts distribution centres in Toronto and Vancouver. The Toyota Corolla, Matrix and RAV4 are built for the North American market at Toyota Motor Manufacturing Canada Inc. (TMMC) in Cambridge, Ontario, a recent recipient of the Gold Plant Quality Award in the 2010 J.D. Power and Associates Initial Quality Study (IQS).